To say 2016 has been a tough year for race relations in America would be a laughable understatement. It's gotten to the point, in fact, where anyone choosing to ignore the situation or avoid dialogue on the topic is increasingly being seen as part of the problem. That puts brands in an awkward spot. In a world where brands are increasingly expected to humanize their marketing and speak to consumers in meaningful ways, what are they supposed to say as it relates to ingrained cultural racism and violence against minority communities? At the height of this summer's racial turmoil, some marketers chose to speak out. The tech community in particular took to social media with calls for tolerance and, in particular, support for the Black Lives Matter movement. And guess what? A lot of people called B.S. on them. So. Where's the marketing play in race relations? Should there be one at all? Certainly plenty of brands have appropriately championed human rights campaigns throughout history. But building a campaign around a message of love in support of gay marriage isn't the same as wading into the national dialogue on racially charged shootings and protests. Let's take a look at some of the various ways brands have dipped their toes into the topic -- or, in some cases, done cannonballs into the deep end. The results? Let's just say they vary. Long before Ferguson and Black Lives Matter, an unlikely brand -- Becks Plastilin -- issued its almost shockingly adorable charge to the world to overcome legacies of racial hatred. Under the tagline "Let the kids build a better world," the modeling clay maker's 2009 print ads presented claymation figures of historically warring cultures making amends. Including -- yep -- a klansman trying to woo a black woman with flowers. Another iteration dreamed of Jews and Arabs getting together for a good old-fashioned disco dance party. The campaign scored a few headlines -- but not much beyond that. While a few modeling clay print ads about ending cultural hatred among various groups is refreshing (and strangely cute), no one in 2009 was saying that Becks set out to alter the course of race relations overall. No, no. That was Starbucks in 2015. More specifically, Starbucks CEO Howard Schultz. In March 2015, as racial unrest again ignited in Ferguson and around the nation, Starbucks and Schultz -- driven by a deep personal need to "not be a bystander" -- launched the "Race Together" initiative. It was an ambitious and seemingly heartfelt push to open up the dialogue on race relations by encouraging baristas and patrons to begin conversations around the heated topic of race. You can imagine how it went. The social backlash was intense. The media skewering was relentless. Ultimately, the initiative was pulled back. On one hand, you want to ask Schultz what he was thinking. Encouraging baristas to start emotionally charged racial conversations while whipping up someone's morning Frappuccino? Really? But at the same time, you want to high-five him for trying. If Starbucks can't leverage its customers' goodwill for change, who can? And shouldn't you at least try? After all, inaction is a big part of why our nation finds itself in its current racial climate to start. 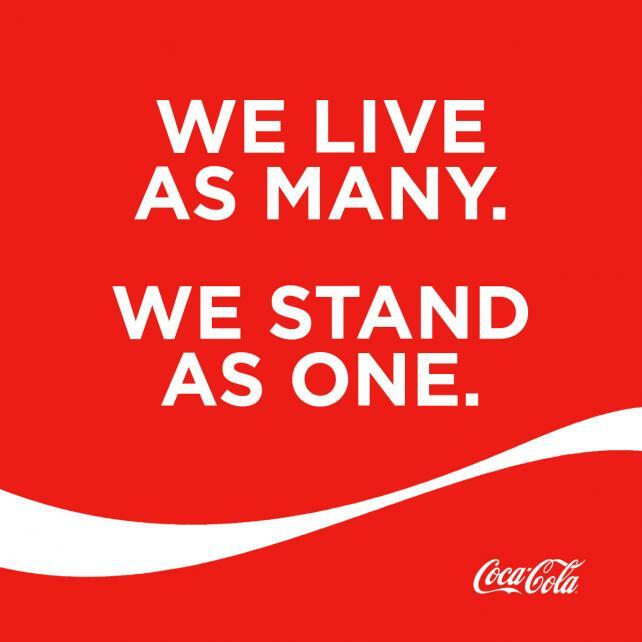 Fast-forward a year, and we find mega-brand Coca-Cola daring to throw its hat in the ring of racial conversations. Albeit, with a less grandiose initiative than that of Starbucks. But ground-breaking all the same. The brand's full-page ad in USA Today -- stating, "We live as many. We stand as one" -- was run in response to the racial debate and tension that occurred in the wake of the high-profile killings of two black men by law enforcement and the deadly attack on police officers in Dallas. The ad and message was pushed in social channels as well, where it was greeted with an unsurprisingly mixed reaction. The lesson? Well, I'm not sure one can be conclusively drawn. On one hand, the snark and backlash against brands trying to spark meaningful dialogue around issues of race would suggest consumers just aren't looking for their politics to mix with their caffeinated and carbonated beverages. But can and should brands remain silent on the matters of humanity? I would argue (and please do feel free to argue in the comments) that they should not. But they damn well better have thick skin. The models in the brand's "Face of the City" campaign aren't models at all. They're algorithmically generated women designed to represent the ethnic blend of different global cities (London, New York, Tokyo, Paris, Milan, and Berlin). Thus, in appreciating the beauty of one computer-generated model, you are essentially appreciating the beauty underlying the city itself were all ethnic separations to be dissolved. Speaking of legacies of celebrating diversity, let's end with another from Honey Maid, the new unlikely poster child for inclusive advertising. Widely heralded for its messages of love around families of all kinds, one of its latest ads is a very effective reminder that skin color is not what defines us and not what defines a family. Cheers to Honey Maid and all of the other brands seeking to broaden the narrow-mindedness of racism. Even when those brands stumble, they move forward.